Offers the following five new apprenticeship/extended learning opportunities. To qualify for any of the apprenticeship /extended learning programs you must have first attended the Pro Shaper four day coachbuilding class. Information on lodging, meals, and transportation below. You can choose to start the program at anytime but we prefer the beginning of the month. Please inform us of the days you want. An E-mail confirmation will be sent upon completion of purchase. If you have any questions or concerns please call Wray (508) 347-7749 before you purchase. If sickness or family problems occur you can interrupt your attendance, and make up the time later. Graduation certificate given upon completion. 30 plus day apprenticeship/extended learning. Description of the program: Students will be shaping panels for one or several of the five complete car body wireform/bucks currently in the shop. The intent of this class is to build on the skill sets learned at the previously attended four day comprehensive coachbuilding class. With 240 hours of hands on shop time, the students will have ample time to fully digest all of the rules of shaping sheet metal into any shape desired. The 240 hours start when you arrive, you will be building on what you learn day after day. All aspects of coachbuilding will be addressed and all questions will be answered. Students will leave after 240 hrs of intensive shop time with a deep understanding- a full spectrum view- of the techniques and tools of the professional coachbuilder. The 240 hours will be taken in 8 to 10 hour days- depending on what works best for you- the class ends when you reach the 240th hour of attendance. Every month, also has two classes scheduled; the four day coachbuilding class and the three day advanced/finishing class. As part of the 240 hrs you will also attend both classes for free, further reinforcing your skill sets. 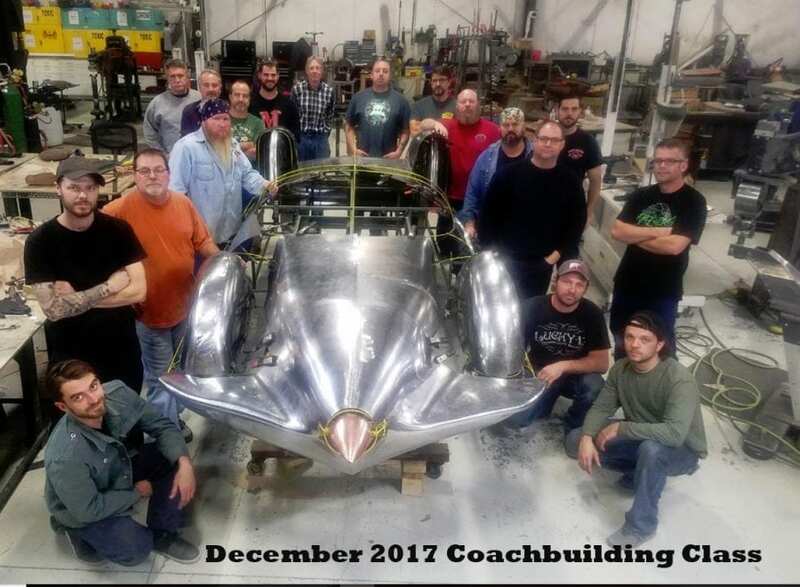 This program is focused on collector car coachbuilding but the skill sets are the same if your interest is sculpture, architectural elements, aircraft, furniture, aluminum boat building, display, and others. Up to four students might be attending the extended learning program each month. Learn in a fully equipped 20000 square foot active coachbuilding shop. Learn the full spectrum of traditional techniques and also new techniques that Wray has developed over the last 30 years. Wray Schelin has over 50 years of collector car experience. Same information/program as the above except instead of 240 hrs, the duration will be 60 hrs. Cost $1000.00 per 60 hrs paid in advance – no refunds. Same as Program 1 except the student can bring their own car or project to the shop to work on. To qualify for the program the student must have previously attended the Pro Shaper four day coachbuilding class. All car/or other projects have to be approved beforehand to be accepted. The work to be performed on the student’s car will be limited to sheet metal only- no mechanical work. Materials used will be an extra charge. The cost of Program 3 will be $5000.00 for 240 hrs of shop/learning time on your own vehicle / Metal Shaping Project. Same rules apply as Program 3 but the time is limited to 60 hrs total. To qualify for the program the student must have previously attended the Pro Shaper four day coachbuilding class. All car/ or other projects have to be approved beforehand to be accepted. The cost of Program 4 will be $1500.00 for 60 hrs of shop/learning time on your own vehicle / Metal Shaping Project. Same as program 4 but the shop time/extended learning is by the hour. Cost for program 5 is $25.00 per hour plus materials used. There are three refrigerators, two microwaves, one full size electric stove, several crockpots, and a propane grille in the shop for the students to cook their own meals if they chose to. Students will be required to clean the cooking pots and pans after each meal. There are also plenty of fast food sites within minutes of the shop. There are at least 20 motels within 15 minutes of the shop, I will see what monthly rates they will offer my students. Best to have your own car, rent, or ride-share. × Any questions let us know!